The autumn farmer's market is bursting with pumpkins and every kind of squash. Butternut squash, or it's mini version, honey nut, is both sweet and mild. As with most vegetables, roasting brings out a depth of flavor and enhances the natural sweetness. And because of the high sugar content of squash, it pairs perfectly with a spice blend like za'atar and the earthy savory notes of tahini sauce. 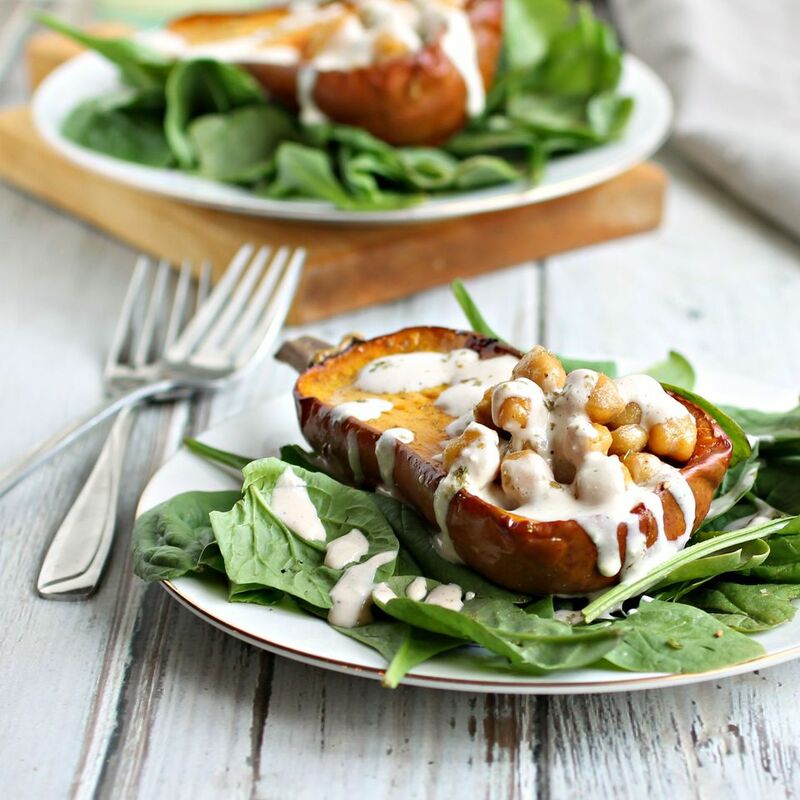 Chickpeas are a great protein source for this vegetable dish and roasting them gives them a crunch and adds interest to the creamy texture of the cooked squash. Regular tahini sauce is great to serve with this dish but this Greek yogurt version is extra creamy and makes an excellent dressing for the baby spinach leaves that add a fresh element to this otherwise roasted dish. You can also serve the butternut squash and roasted chickpeas over a bed of rice as more of a vegetarian entree. ﻿Pre-heat the oven to 400 F.
Split the squash in half lengthwise, scoop out the seeds, and rub with 1 tablespoon of the olive oil. Place on a baking sheet lined with parchment paper and roast for 45 minutes or until the squash is tender. Toss the chickpeas with the remaining tablespoon of olive oil. When the squash has cooked for 25 minutes, add the chickpeas to the baking sheet for the remaining 20 minutes. Make the tahini sauce by adding the garlic clove, sesame paste, Greek yogurt, lemon juice and water to a small food processor. Puree until completely smooth and season with salt and black pepper to taste. If you'd like the dressing a little thinner, continue adding water, 1 teaspoon at a time, until you have the desired consistency. Serve each half of the roasted squash with half the chickpeas. Sprinkle with the za'atar and drizzle on the Greek yogurt tahini sauce. Serve over a bed of baby spinach or cooked rice. Note that you can store your finished tahini sauce in a covered jar in the refrigerator for about 4 days but it will thicken as it stands. To thin it out, add a little bit of water and lemon juice, then check the seasoning again to get it where you want it.